An incredible season of college basketball came to a close last night with Kentucky defeating Kansas, 67-59, to claim the 2012 NCAA National Championship. And, for the first time in a while, the Wildcats won with defense. (Unfortunately for @JohnGasaway, Kentucky's D > Kentucky's O on the biggest stage). Below is the national title game Defensive Score Sheet for both Kentucky and Kansas. While Anthony Davis won the Most Outstanding Player award for the entire Final Four, Davis wasn't the best player on the floor Monday night defensively; That was Kansas' Jeff Withey. While Davis forced 11.33 of Kansas' 40 misses (28 percent), Withey forced 17 of Kentucky's 33 misses (52 percent). While Davis' defensive rating (75.5) was lower than Withey's (84.9), comparing each to his respective team's defensive rating shows how much Withey meant to the Jayhawks last night. 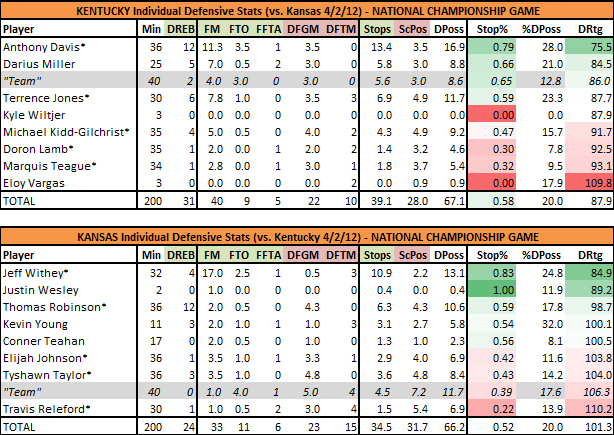 Withey's DRtg was 16.4 points better than Kansas's team DRtg while Davis' was only 12.4 points better. 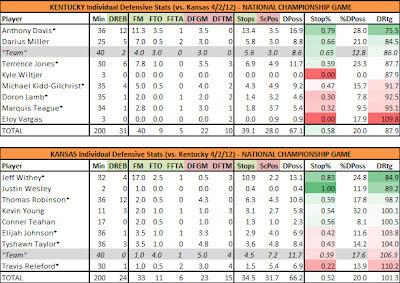 Don't mistake my point: Both players were phenomenal on defense, but Withey was actually better in the title game. If Withey was more of an offensive weapon there is no doubting Bill Self would have kept him on the floor longer. However, with Davis guarding Withey, Kansas was pretty much playing 4 on 5 offensively whenever Withey came up for a high ball screen. Davis never moved past the free throw line when Withey had the ball near the 3-point line and for good reason; Withey was not going to shoot 16-18 footers and Davis' protection of the paint was more important. For all the talk of Kentucky's freshmen, senior Darius Miller had a spectacular defensive game off the bench. In 25 minutes he crashed the glass, forced seven misses (including two blocks) and was a leader when Kentucky needed one. Luckily for Kentucky, "Good" Terrence Jones showed up on both ends of the floor. Despite some early foul trouble, Jones did a masterful job on Thomas Robinson and Elijah Johnson. His 7.83 forced misses were third most in the game (behind Withey and Davis). Outside of Withey, no Kansas players really had memorable defensive games. Thomas Robinson was dominant on the glass but it was much more of a mediocre team defensive effort than it was a combination of two or three lock-down defensive performances. That's probably a credit to Kentucky's offense not running through a few players, instead being the depiction of unselfishness. The old saying goes: Offense can get you to the championship game, but defense wins championships. If one team exemplified that statement during the 2012 NCAA Tournament it was Kentucky. The Wildcats won Monday night because of their defense. Period.